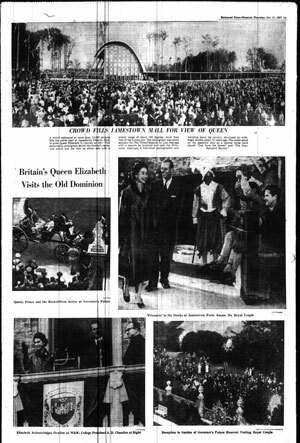 Many of the state’s newspapers carried extensive accounts of the royal visit. Here is a sampling of the many articles that appeared in the October 17, 1957, Richmond Times-Dispatch. 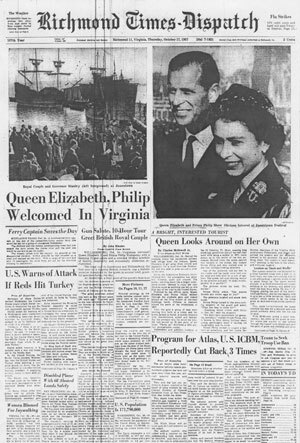 "Queen Elizabeth, Philip Welcomed in Virginia"
"Queen Looks Around on Her Own"
"Bible Errors Are Amusing to Royal Pair"
"Text of Elizabeth’s Speech at Dinner"
"The Queen Visits Soil of Her Ancestors"